I got this book from my favorite book-swap site, Paperbackswap.com. Novels set in the Middle Ages normally do not appeal to me, but this one did. 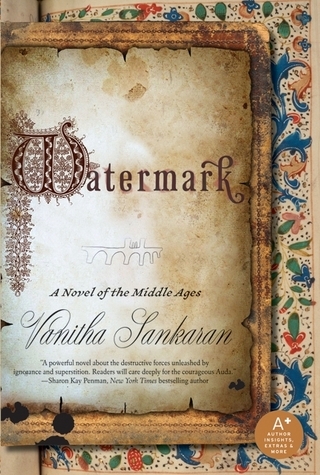 Here’s the first two sentences from the synopsis on the back cover: “Watermark: A Novel of the Middle Ages — The daughter of a paper maker in a small French village in the year 1320–mute from birth and forced to shun normal society–young Auda finds solace and escape in the wonder of the written word.” This sort of intrigued me, so I dove in. I would say I enjoyed about 3/4 of this book, maybe a bit more. It was interesting to read about life in the 1320’s and also I feel like I learned a lot about the history of paper making. There was a lot of brutality going on at that time, particularly related to supposed heretics of the church. The burning at the stake and other unpleasant goings on were disturbing, but since they really did happen back then, I plugged along. Unfortunately, the ending was quite predictable and weak. That said, it was still interesting and brought to light a period of time that I personally was very uninformed about. This entry was posted in Books 2014 and tagged book review, Middle Ages. Bookmark the permalink.